iPlayer | Really useful stuff that I bump into…..
get_iPlayer downloads BBC iPlayer TV and Radio programmes – so that you can retain and view them for posterity. 1. Read the original article that explains how to install and use get_iPlayer, but PLEASE DON’T install it from the links on that page. 2. Install the latest version of get_iPlayer from here – and catch up with the forum and discussions etc. The Square Penguin folk have done a really great job and are to be applauded. 3. Read this article for those who are having trouble recording and/or finding programmes in the iPlayer feeds. I am NOT a Lawyer – and therefore not an expert on the legality (or otherwise) of downloading material that the BBC make freely available for subsequent offline viewing or listening. However, I have paid my TV licence to the BBC and consider that downloading BBC material for offline playing once – as if I had watched it at the time of original transmission – followed by subsequent deletion (not retention) is fair use and my right as one of the folk who have contributed to the BBC for the original production of this material. Reading further, is your acknowledgement and acceptance of the same principles and you confirm that BBC material obtained as a result of this article is for your own, temporary use. Furthermore, you acknowledge that the author of this article is NOT the author of the applications listed and that this article only points to products and information that already exist freely in the public domain. I am indebted to Matt Robinson, who wrote the original Radio Downloader and who therefore brought a little sunshine into my life, by allowing me to listen to the previous night’s Zane Lowe on my Walkman while I commuted to work. It appears that Matt has now received a “Cease and Desist” order from the BBC which is so sad – as it follows on from the unnecessary approach the BBC took with Lawrence Gripper – when they had previously been more than happy for him to promote them via his Windows Phone app (however, fear not BBC News fans, an alternative called “Paper Boy” is on the way!). 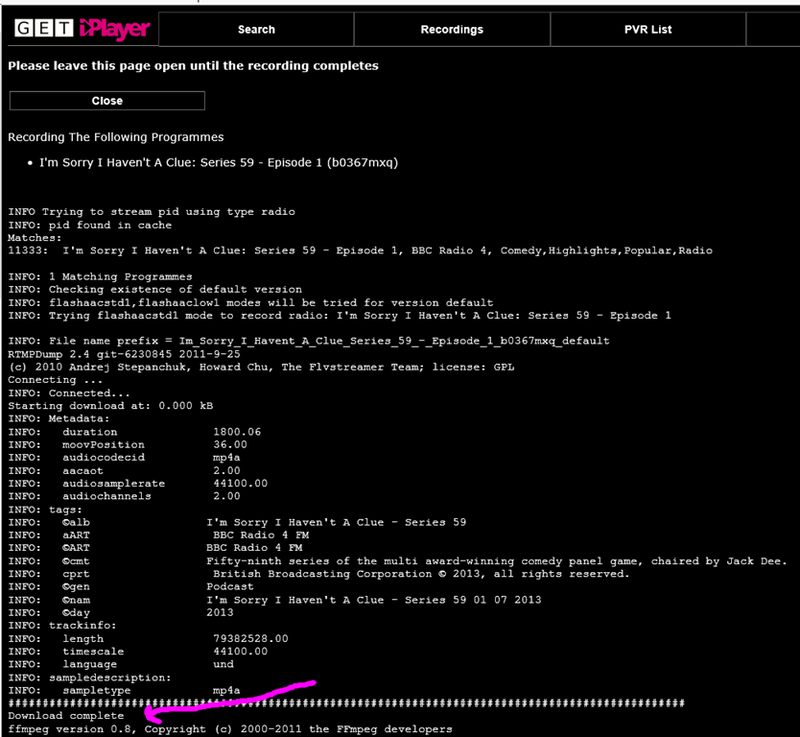 So, the search was on to find an alternate way of downloading (for offline listening) BBC Radio programmes. 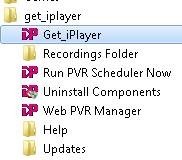 Now, get_iplayer is an extremely feature rich application which runs on Windows and Linux. In addition, it can be run in either command mode or via a Windows interface. More technically advanced readers will probably find the command mode to their taste – but I prefer to use the Windows interface, which is not immediately intuitive if it is your first time of using this application. 1. 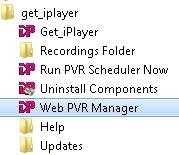 Download and install get-iplayer. 5. This should open a get_iplayer Search interface (in your default browser) that will search the catalogue that it downloaded in step 2. [It is a good idea to re-run step 2 in order to update the current programme catalogue on each separate occasion that you want to record something]. 6. 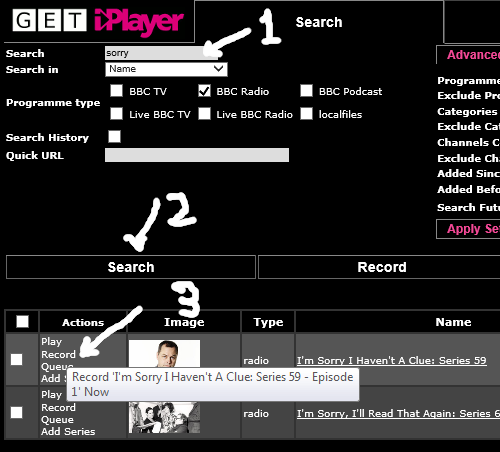 For TV programmes, just do a search and select “record” in the little box next to the programme that you want to record. 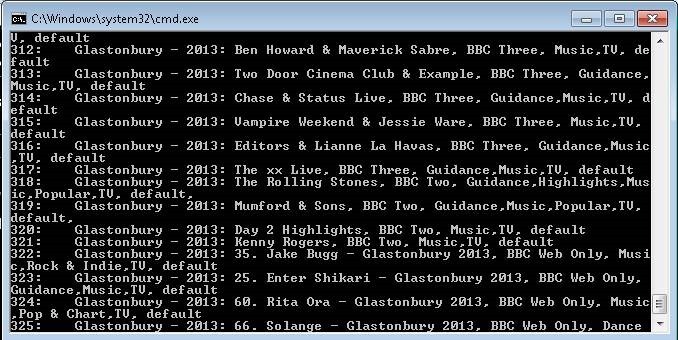 This will open up a new page and you will see that programme being locally downloaded to your PC. Note: that what gets downloaded has NO DRM – so in theory, you can keep it as long as you want – as long as you have purchased a UK TV licence I guess (I am not a Lawyer). 2) Put the name of the Radio Station in the “Channels containing” box. 1) Put a matching word from the title of the Radio programme (that you are searching for) in the “Search” box. a) Locating the radio programme you want to record in here: http://www.bbc.co.uk/iplayer/radio# and copy the link (url). Look out for “Download complete” and you are done! Please additionally feel free to comment on this article with your tips and tricks for getting the most out of get-iplayer. Note: That this article is now deprecated. Please see the replacement article on get_iplayer and continue to comment at that new page. If, like me, you listen to a lot of BBC radio – and are frustrated that unlike iPlayer videos – which you can download for viewing later (on a PC, iPod, iPhone, Sony Walkman, Zune etc) there is no way to download BBC radio programmes from iPlayer. All you can do is listen to them within the iPlayer interface – but if you want to save them to a portable device for listening to later on the tube – forget it! There are some very complex kludges that you might try – but nothing as elegant as Radio Downloader by a guy called Matt Robinson. This is an absolutely superb application which, iPlayer like, displays all possible Radio programmes that are available at iPlayer – by genre, alphabetic listing etc. Simply click the one you want, hit “Download” and Radio Downloader downloads the programme as an MP3 – ready for you to write to your favourite portable media device. This one is such an incredible gem – and if you have found this article because you have been searching for a solution to the iPlayer radio problem – you will really, really appreciate it. So please, show your appreciation to Matt Robinson by donating him a couple of quid. 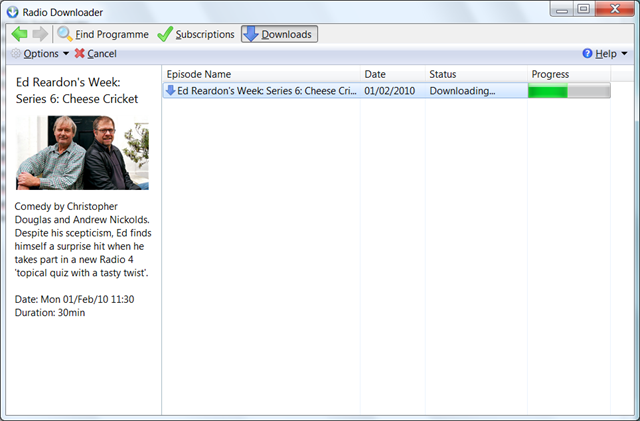 mce-media-core – the best iplayer add-on for Windows Media Centre (MCE). The really cool thing about Windows Media Centre (to be found already installed in most versions of Vista and Windows) is that it is a central repository of all, well, your media. The problem is, that if you like using the BBC iPlayer, you effectively have to minimise the MCE interface and fire up a browser in which to watch iPlayer re-runs. Wouldn’t it be great if you could get iPlayer to run within MCE? Well, now you can. While there has always been the Milliesoft MCE iPlayer add-on, I could never get it to work properly – and it was pretty resource hungry on my low power MCE (which also has a low bandwidth broadband connection). So, step forward the gobsmakingly good mce-media-core. This really is an absolute gem – and probably the best add-on/plugin I have ever seen for MCE. What’s more, it doesn’t use Flash but wmv streams. As a consequence, you have to wait a minute or two for it to initially buffer, but once running, the video is broadcast quality – with no stuttering (like you can have with CPU intensive Flash rendering). mce-media-core is still very much at the alpha phase, so some features don’t work (yet). I can’t get it to play BBC HD streams and there is no fast-forward or rewind – but I am sure that will be fixed as the product matures – unless Microsoft offers the author a job (and they really should).